A news article popped up on my twitter feed when one of the people I was following posted up this article from The Columbus Dispatch on March 9, 2013. It’s interesting to see how I’ve been hearing more articles and news of exertional rhabdomyolysis, especially in the athletic community. If this sounds familiar to one of the blog posts I have written before, it should. In my blog post “CROSSFIT: GOOD, BAD OR JUST A FAD?“, I included an article where a cross-fitter was admitted into the hospital for rhabdomyolysis. You can read that article here. Image from The Columbus Dispatch. According to the article, “The workout included pull-ups (she did 56), chin-ups and triceps-crunching dips without rest during a 20-minute workout. Two days later, they pushed football blocking sleds” (The Columbus Dispatch 2013). After finishing the workout, she immediately sensed things weren’t right. 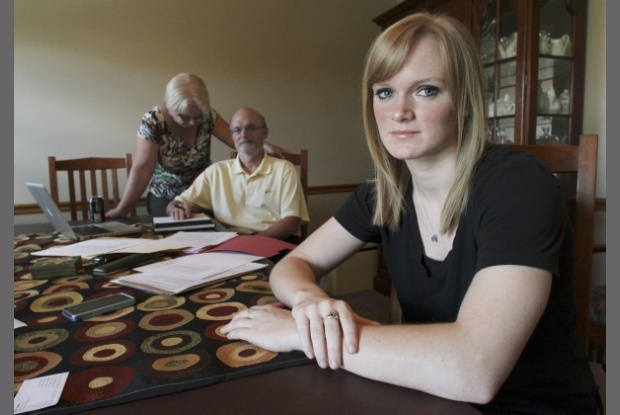 She recalls having weakness and tingling in the upper extremities while driving home after practice. That same night she could not get a proper night of sleep because of the pain and the next day noticed that her urine color was the same as cola. “[R]habdo can have potentially serious consequences: renal failure, compartment syndrome, death. Those are fairly serious” said Kelsey Logan, a physician who serves on the NCAA Committee on Competitive Safeguards and Medical Aspects of Sports. Some of the cases of rhabo, short for rhabdomyolysis, have left athletes requiring surgery because of compartment syndrome. According to PubMead Health, compartment syndrome is, “Compartment syndrome is a serious condition that involves increased pressure in a muscle compartment. 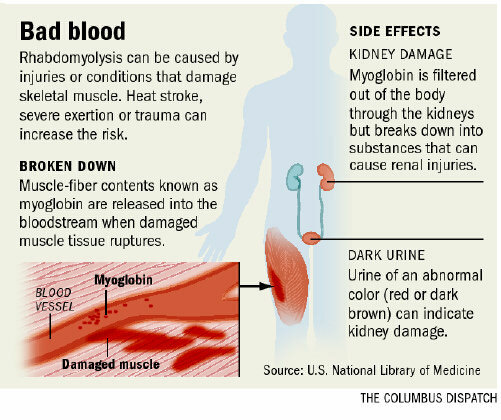 It can lead to muscle and nerve damage and problems with blood flow.” (You can learn more about it or rhabdomyolysis in the references listed at the bottom on the post.) In the more severe cases, amputation might be needed or even death can occur! ‘”Because (rhabdo) is rare, and coaches or trainers have not seen it, they can’t understand how they caused it,” said Priscilla Clarkson, a leading expert on rhabdo as an exercise science professor at the University of Massachusetts. [Even] Kelly Becker noticed that the condition isn’t mentioned in the NCAA Sports Medicine Handbook’ (The Columbus Dispatch 2013). Heck, I haven’t really heard of rhabdo until fairly recently – and there’s not a lot of awareness out there in the athletic community, let alone the general public. I think that some coaches some athletes are misinformed that you if you are not puking or hurting/feeling the burn through your workout, you’re not working out enough. I think that is totally absurd. There are safe and effective ways to train other than just to failure and leaving yourself a gelatinous blob on the floor. The one thing that pops into mind is the recent fad of Crossfit. I think that many young athletes view this exercise craze as the best way to get in shape for their sport. They will do crazy things like lifts, squats and throws to failure all with no rest in between rounds and sets. Even rhabdo shows up in the Crossfit community, as an example in the earlier link to the article above. Again, you can read why I think Crossfit is not really good conditioning for athletes in my blog post here. Take adequate rest in between sets, exercises and days. You know your body best, not the coach! Drink plenty of water: before, during and after working out. If you sense something is not just right, have a medical professional check it out such as your family/team doctor or your team’s athletic trainer. It’s better to play it safe. If you’re not comfortable doing it, tell the coach. If you showing symptoms, air on the side of caution and have it checked out. Better to be sidelined for a couple of days than have your season or career be thrown down the drain.